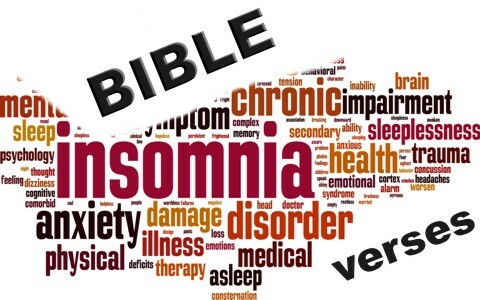 What are some great Bible verses for insomnia? If you read that verse, it seems to be saying that God gives to His beloved sleep but those who are “eating the bread of anxious toil” cannot sleep. There is no reason to have anxiety for God promises to take care of His own. Peter writes that you are to be “casting all your anxieties on him, because he cares for you” (1 Pet 5:7) which means you can “Cast your burden on the LORD, and he will sustain you; he will never permit the righteous to be moved” (Psalm 55:22). Shouldn’t that give you enough peace of mind to sleep? …the Lord can cause you to sleep when you can’t seem to sleep on your own. There is nothing greater than to lie down and sleep and have no fear. For many in the world today who are Christians, they have the fear of having their home broken into and taken captive by those who hate Christians and would love nothing more than to kill them. Most of us don’t know what that’s like and the vast majority of us have no fear, from the enemies of Christ, when we go to bed but strangely, for those who are in the most dangerous parts of the world for Christians, they seem to have more peace of mind. Many who live in the most prosperous countries might lie awake at night worrying about work the next day or what bills may be coming in the mail or how to make it to the next paycheck. For those who have less, they are not anxious about things like that. Those who are in greater danger from persecution sometimes have the most peace of mind. I know of at least two former Muslims who converted to Christianity but they understand that the worst thing that could happen to them is that they’re killed for their faith…but then, they’re present with the Lord (2 Cor 5:8). That’s not too bad is it? Job lost about everything; his children, his home, his crops, his livestock…everything he had was taken away yet he knew he could lie down and not be afraid because he knew that if God was for him, he had no fear of anything or anyone ever being against him (Rom 8:31). You should go to sleep with that knowledge too. Elijah was discouraged. He had been running for his life and feared that he’d be killed by the wicked Queen Jezebel. When we grow discouraged and tired, the best solution can be to just get some sleep…and then arise and eat…and then maybe get more sleep. Elijah felt like giving up and felt as though he was alone in his resistance against evil but God plus one is always a majority and sometimes the best thing we can do is to get some good sleep. Talk about peace of mind! Here was Jesus sleeping in the boat while “a great tempest in the sea” was occurring. The Greek word used for “tempest” or some translations say “storm” is “seismos” and it is the same word we use for seismic or earthquake and so this was no small storm just passing by. The disciples feared for their lives but Jesus was secure in the knowledge of the sovereignty of God and knew that this was not His time, therefore He was able to sleep peacefully, even during a great, seismic event of such a titanic storm. That is true peace of mind. Have you ever felt that way when you woke up? Apparently Jeremiah never had any problems sleeping because his sleep was pleasant to him and when he awoke, he must have felt refreshed. I agree…I like sleep…it’s pleasant to me too. We all need sleep and when you can’t sleep, try to pray about it, even while you’re lying there in bed. For me, when I can’t sleep, I get up and pray. I know this sounds odd but it works. I feel more peace after praying to God. I can receive more of God’s peace by asking Him to help me sleep and He does. In Genesis 2:21 we read that “the LORD God caused the man to fall into a deep sleep; and while he was sleeping, he took one of the man’s ribs and then closed up the place with flesh” so the Lord can cause you to sleep when you can’t seem to sleep on your own. Even Job could say “You will be secure, because there is hope; you will look about you and take your rest in safety” (Job 11:18) and if you are a child of God, you are as secure as you possibly can be and you can pillow your head at night with that knowledge. Omg….this article has blessed me in so many ways I appreciate you and your Bible knowledge and I thank you for writing this for other things who are going through troubles and having difficulty sleeping !!!!!! I often have trouble sleeping, both falling asleep and staying asleep. I am not anxious or fearful or anything else. I just simply can’t sleep. I pray and still can’t sleep. I’ve tried both natural sleep remedies and prescription remedies, none of them work. I still end up tossing and turning, most nights. God omises us rest and sleep and in tired of not getting any or least no where near enough.even ahem I can get to sleep, it seems like things get in the way. I work nights for the moment, that’s 12 hour shifts 5-7days a week 6pm-6am. The other day I had a couple things to do before I came home and went to bed. I got all that done and finally got home only to find out that the land Lord hadhired a tree trimming service but didn’t inform us about it and it was going to take a while for them to do what they were here to do, and of course it was too,noisy for me to be able to go to sleep. I would like to receive your newsletter. Thank you. I have had a struggle all my life for 61yrs now with sleep. I fight fear and anxiety, always fearing about my salvation. Any help would be appreciated. I am going through the same thing. No sleep mo matter what I read, watch, do or don’t do. I cry some nights because its frustrating. Yes I have prayed, continuously over the years and still nothing. Truly saved question. It’s in 1 st John : 7 questions. 1. If you love me you will obey me. Do you obey ? Over the years since you’ve been a Christian, do you find yourself obeying more and more? 2. Do you confess with your mouth Jesus is Lord and Gods son? 3. Do you keep a short record of repentance statements? Every day? ” Lord please forgive me for just lying to my boss!” I don’t know why I did that! Please reveal to me why I did that. 4. Does God discipline you?. And you know when he disciplines you. Like when you know you need to stop speeding and you even tell people you have a problem speeding a lot and you keep getting tickets. Sometimes they let you slide, but you still get tickets. Even with warnings. He’s disciplining you. Duh. Or you don’t clean your house when you know something told you to clean your house today and lol and behold, someone important comes by for a visit. How embarrassing. All God. 5. Do you have an overflowing love for other GENUINE good as gold Christians? Do you get excited to meet your brothers and sisters in the Lord? Does it give you energy after a 12 hour shift? And you needed something to push you through? 6.do you feel the presence of the Holy Spirit? Not every day ofcourse, but do you have those lightbulb moments when you know He’s talkin to you ? Moments when you feel so on top of the world because he opened your eyes on something and He gave you a four-liner?! Like” I am witty you” or ” this is your home”? Holy Spirit moments when you walked the way you felt right and you get your socks blessed off, or people tell you they know you are a Christian because you shine! That’s the Holy Spirit in you. 7. Do you trust IN HIM Alone? Not meds first? Not massage first? Not pet therapy first? Not counselor sessions first? Not alcohol ? Do you trust HIM Alone for salvation ? Oh. And not money or your hard work either. That’s it. It’s all in 1st John.